Day for which many individual was waiting has finally came, Finance minister P Chidambaram has presented Union budget 2013-14 on 28th Feb,2013. Prior to budget many expectation were set that tax relaxation will be given, inflation will be reduced but for common man this budget seems to be disappointing. Let’s Review Union Budget 2013-14 & its impact on you in detail. Most of the people have demanded to increase tax exemption limit from 2 Lac to 3 Lac in this budget, but tax limit remains unchanged. Additional benefit of Rs 2,000 to individual tax payers with taxable income of up to Rs 5 lakh is given. Finance minister has just press copy paste button and place same tax slab for next year which is as follows. 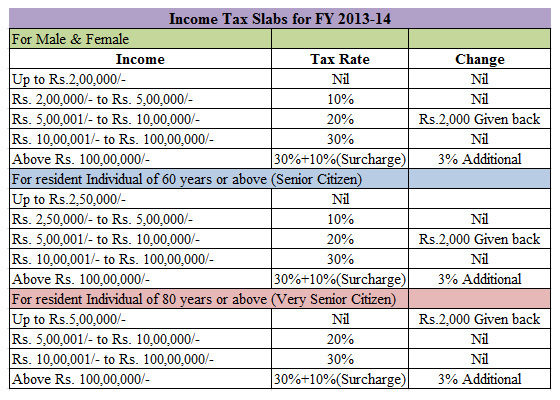 This new tax slab brings no saving for individual. Previous year with introduction of new tax slab at least individual was able to save money from 2,060 Rs/- to 22,600 Rs/-. This year finance minister even don’t want that common man saves extra money. Additional surcharge is imposed on super rich. Person earning income more than 1 Cr will be considered as super rich and additional surcharge of 10 per cent on the income will be applicable for super rich, apart from this 5 to 10 per cent surcharge is applicable on domestic corporates whose income exceeds Rs 10 Cr a year. In a move that will bring cheer to many prospective home-owners, additional deduction of 1 lakh is given on interest amount. 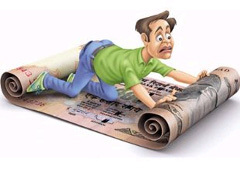 This is applicable to person taking home loan up to Rs 25 lakh for first time during the financial year 2013-14. Positive changes were made in Rajiv Gandhi Equity saving Scheme. The RGESS is liberalized to enable first time retail investors to invest in mutual funds and listed shares and not in one year alone, but for three successive years. The income limit for RGESS has been increased from Rs. 10 Lakhs to Rs. 12 Lakhs.Now Under the scheme, an individual with an income of less than Rs 12 lakh would get tax incentives for investing up to Rs 50,000 in the stock market. Good Step taken by finance minister on account of inflation is announcement of inflation-indexed funds, new saving instrument will be introduced in consultation with RBI that will protect savings from inflation especially the savings of the poor and middle classes, and these could be inflation-indexed bonds or inflation-indexed national security certificates. Details will be announced later. The limit for duty free import of gold has been increased – men are allowed to bring Rs. 50,000 worth of gold jewellery and women are allowed to bring Rs. 1,00,000 worth of gold jewellery duty free. Tax free bonds of up to Rs. 50,000 Crores would be issued in FY 2013 – 2014. So, you would have many opportunities to grow your money completely tax free! The Securities Transaction Tax (STT) has been reduced marginally for various categories of transactions. Its impact would be insignificant for most retail investors. A new Commodities Transaction Tax (CTT) has been introduced for trades in all non-agricultural commodities. Again, the impact on your is going to be insignificant. A Tax Deducted at Source (TDS) of 1% has been introduced for land deals of more than Rs. 50 Lakhs. This is however not applicable on agricultural land deals. The import duty on set top boxes has been increased, which means that you would end up paying a little more for your set top box. The excise duty on cigarettes, Sports Utility Vehicles (SUV) and marble has been increased, making them costlier. The import duty on most mobile phone has been increased – you can expect a marginal increase in their prices. Service tax would not be applicable on all air conditioned restaurants, so expect your restaurant bills to increase by 12%! So like every year this year also Finance minister has done his task of making Budget of 2013-14. (1) Tax is imposed on super rich but no benefit is given to normal tax payers. (2) Additional Home loan interest deduction is given but only for new home loan takers. (3) Rajiv Gandhi Equity saving scheme is modified but I don’t think for small tax saving first time retail investor participate in this scheme. (4) Inflation Index Bond is introduced but proper details are not given hope it will bring protection against inflation. (5) STT is reduced but marginally not bringing significant change to retail investor. (6) TDS 1% is introduced for land deals of more than Rs.50 lakh. This is positive step to locate source of black income and big transactions. (7) No measures announce to increase number of tax payers.